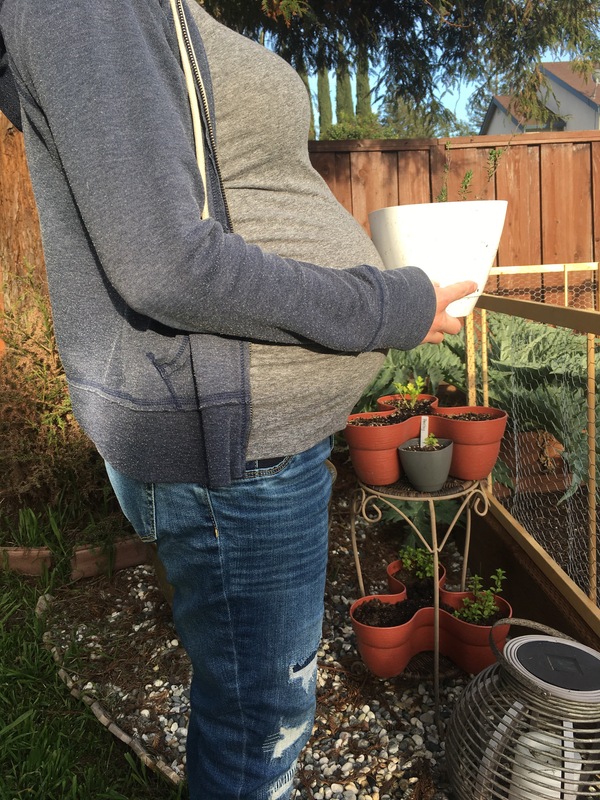 Gardening While Pregnant – Where are the Chickens? I’m excited to say that my husband and I are expecting a baby boy in mid-May! While I am about as excited as one can be to welcome the little guy to the world, I am also pretty much over the whole pregnancy thing. At 7 months pregnant, gardening is getting increasingly difficult. Frankly, from day one, there was always something making gardening difficult. I was very sick for the first trimester and the first few weeks of the second trimester. I had actually intended to plant a winter garden but just couldn’t bring myself to do it at the time. Once the nausea went away I found myself with a short period of time where I was able to fight the constant exhaustion and get some stuff done. That was nice, but short lived. I am now looking quite pregnant and am feeling every bit of it. There are a lot of daily routines that I have never put much thought into, but now have to mentally and physically prep myself for. Putting on socks, tying my sneakers, standing up after sitting, rolling over in bed, coughing… these are no longer easy tasks for me. And bending over? Forget about it. Even when I can manage to bend myself over (and then get myself up), I regret it immediately after and again later that night when my back starts screaming at me. Tables and Stools – I have never had back issues before. But when I hit the 5-months-pregnant mark, I started getting lower back pain and it’s now pretty constant. And if I do too much standing or any kind of bending over it becomes unbearable. I never realized how much I bend over when I’m gardening. If I garden as normal, later that night I’ll find myself in so much pain I can barely move off the couch. I’ve admitted defeat. When it comes to making soil blocks or transplanting into pots – that work can be done on a table. So I have my husband set up a table for me out by my garden and I limit most of my work to what can be done while sitting or standing at the table. Maternity Belt – I just bought this belt a few weeks ago and it’s become my new best friend. Even though I’m limiting my gardening to table work, my back still aches after. So I wear my maternity belt whenever I garden (or do dishes or cooking), and for most of the night after. Pregnancy Wedge – I also like to use my pregnancy wedge when I’m sitting on the couch after a long day and my back hurts. I also like to use it to help support my belly while I’m sleeping, so it’s proven to be quite versatile. Yoga – I’ve always enjoyed yoga. I found a prenatal yoga class early in my pregnancy and started going from the very beginning. I don’t know what I’d do without it. I walk into that class with so many aches and pains, and then I leave feeling amazing. I’ve also picked up a lot of good movements for at home that have proven to help with my back pain. One of my favorites is to move between cat and cow pose with my breath. Gloves – I didn’t used to wear gloves when gardening, but now that I’m pregnant I always do. The main reason being that I’m currently at war with my neighbor’s cats and trying to keep them from using my garden as a litter box. First of all, that’s disgusting and annoying. Second of all, toxoplasmosis is not something to mess around with and is even more of a concern when pregnant. My husband is currently building a fence to keep the cats out (more on that to come!) and picks up any cat poop that we find in the garden. But I still wear my gloves whenever I’m about to dig my hands into the soil. Water and Snacks – During my first and second trimeter I was very nauseous and dizzy. It cannot be understated how helpful it was for me to drink electrolyte-enhanced water and eat small, frequent snacks. And especially so when out in the garden doing work! The only good thing about gardening when pregnant is how fast you heal when you manage to cut deep into your finger with the Sacuteurs…..